Increasingly sophisticated phones and data-hungry applications make it easier than ever to blow through your cellphone plan’s data cap and incur nasty overage charges. Read on as we show you how to manage your data use. Just a few short years ago it would have been almost unheard of to blow through multiple GB of mobile data. Now apps have ballooned in size (it’s not uncommon for apps and their updates to exceed 100MB in size), and with streaming music and video becoming more popular, it’s easy to burn through your data cap in a matter of days. Watching an hour of standard definition streaming video on Netflix or Youtube will readily and easily chew through a gigabyte of data. Bump that stream up to HD, and the data usage basically triples–about three gigabytes of data will be used. Streaming high-quality music over services like Google Play Music or Spotify? You’re looking at about 120MB an hour for that. It may not seem like much at first, but do that for an hour a day for a week and you’re up to 840MB. An hour a day for a month puts you at roughly 3.2GB. If you’re on a 5GB data plan, you just used roughly 65% of it on music alone. Sure, you could pay more for a bigger plan, but who wants to do that? Before you fork over your hard-earned dollars, here are some tricks for reducing your data usage (and keeping an eye on it). 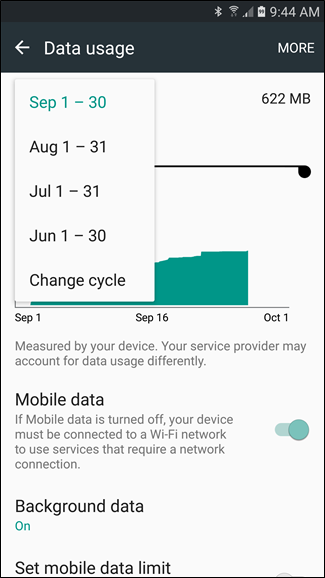 You can get a rough estimate of your data usage using Sprint, AT&T, or Verizon’s calculators, but the best thing to do is actually check your usage over the past few months. It’s worth mentioning that you will need to specify your billing cycle here for the most accurate look at your data usage. 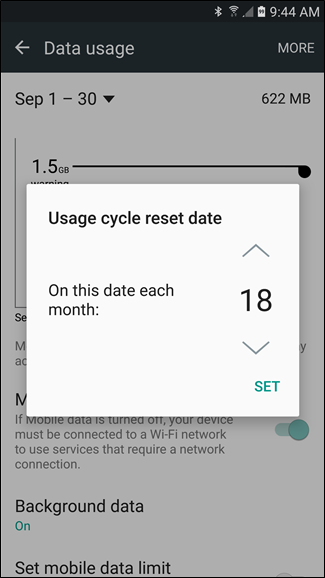 Since your data will reset on the first day of the new cycle, it doesn’t matter what you used the month before, so you don’t want that skewing the results. In addition to monitoring, you can also set data warnings by adjusting the the slider bar to your liking—when you reach the amount specified by the cut off limit, you’ll get a warning to let you know where you’re at. 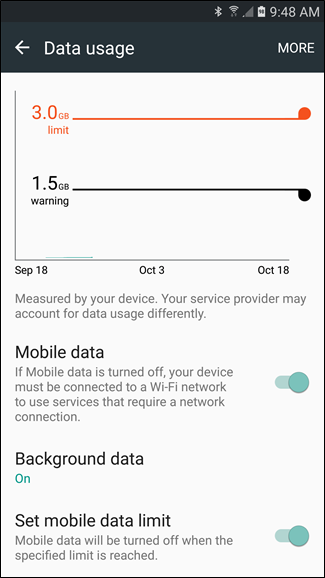 You can also enable the “Set mobile data limit” option, then use the orange slider to specify where you’d like data to be cut off completely. 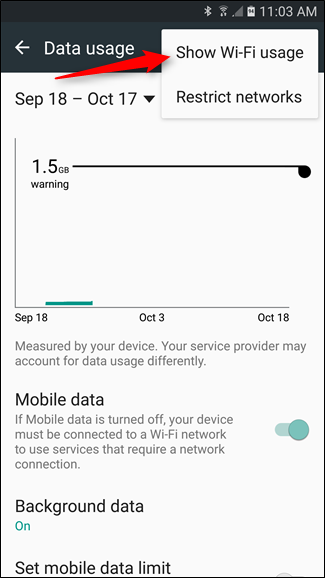 Once you’ve hit that limit, mobile data will be disabled on your phone until you turn it back on. There are two kinds of data sinks when it comes to mobile devices. First, there’s the obvious user-driven data consumption, or “foreground data”. 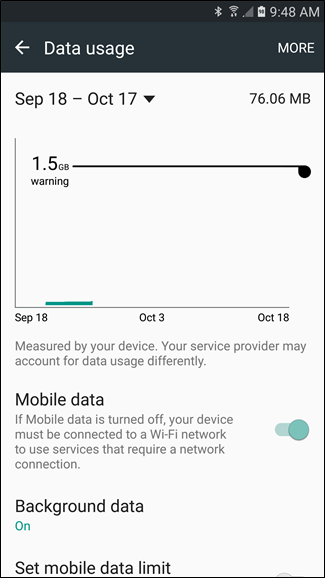 When you watch a high-quality video or download a new album, you’re directly contributing to increasing your data usage for that month, assuming you’re on mobile data and not Wi-Fi. Obviously, to use less foreground data, you need to consciously stop downloading, streaming, and browsing so much. Less obvious to most people, though, is the fairly large amount of behind-the-scenes data churning through your connection—the “background data”. Polling for Facebook updates, high-frequency email inbox checks, automatic application updates, and other background activities can put a real dent in your data allotment if you aren’t careful. Let’s take a look at how we can curtail some of this. 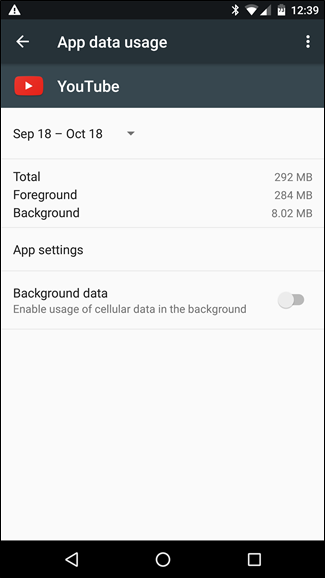 You can limit background data one of three ways: total blackout, individual blackout, or app-based settings. If possible, go back to your home screen and open the app in question. See if it has any settings designed to restrict data usage. 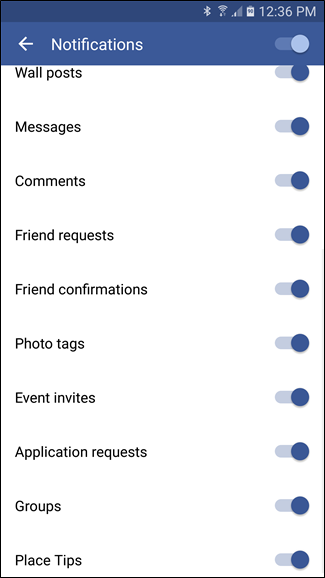 Rather than use Android to restrict Facebook’s data use, for example, you can jump into the Facebook app and turn down the frequency of push notifications or turn them off altogether. Not only does turning off notifications and constant polling cut down on your data use but it’s great for extending your battery life. Not every app will have these kind of settings, however–or have as fine-tooth control as you wish. So, there’s another option. Head back to Settings > Wireless & Networks > Data Usage and tap on an app. Check the box labeled “Restrict Background Data” (in Nougat, this is just a switch called “Background Data”, which you’ll want to turn off instead of on). This will limit its data usage from the operating system level. 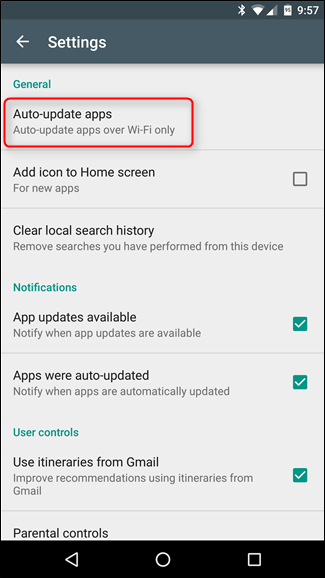 Note that this only applies to a mobile data connection–if you’re on Wi-Fi, Android will allow the app to use background data normally. 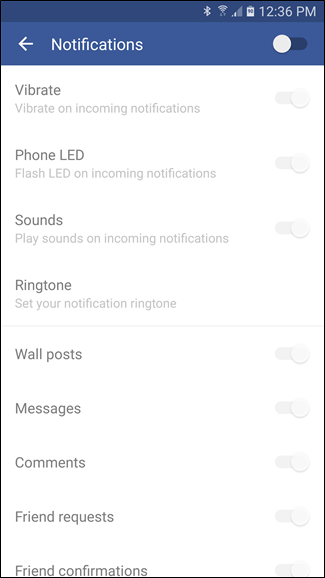 If that isn’t enough, you can also turn off all background data with the flip of one switch—this reduces your data usage in most instances, but it can also be inconvenient as it doesn’t differentiate between data sippers and data hogs. 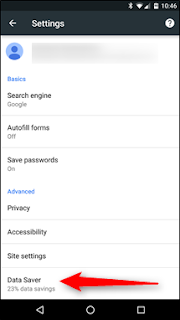 From the Data Usage menu you can press the menu button and check “Restrict Background Data”. 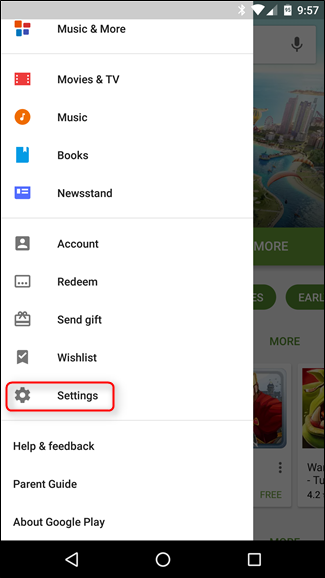 This will turn off background data for all applications. 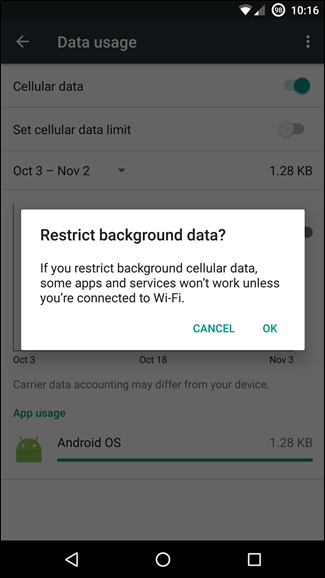 A quick note before we continue: as we talk about restricting background data usage, we want to make it very clear that these restrictions only apply to your mobile data usage; even if you heavily restrict an application it will still function normally when you are on Wi-Fi. Often, apps well offer a free version with ads, and a paid version that is ad-free. Developers need to eat so you can pay them with ad revenue or cold hard cash. Here’s the thing: ads aren’t just annoying, but they use up data too. These upgrades can cost anywhere from $0.99 to a few bucks, and are easily well worth the cash if you use the app often. 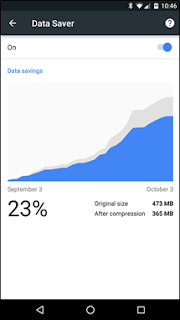 If you surf the web a lot on your phone, Google Chrome’s “Data Saver” mode can make it less of a blow to your data cap. Basically, it routes all of your traffic through a proxy run by Google that compresses the data before sending it your phone. 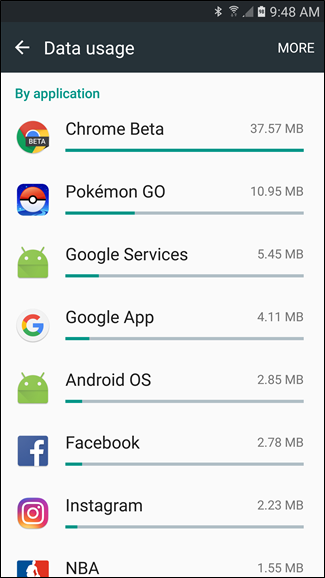 Basically, this not only results in lower data usage, but also makes pages load faster. It’s a win-win. 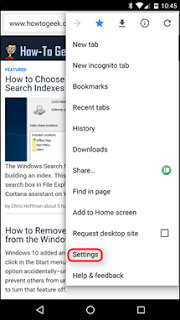 You were likely asked to enable Data Saver the first time you loaded Chrome, but if you decided not to do it at the time, you can enable it after the fact by opening Chrome, jumping into Settings > Data Saver, and sliding the toggle to “On”. The best way to avoid sucking down huge chunks of data while you’re out and about (and dependent on cellular data) is to cache it ahead of time when you’re basking in the glory of a wide open Wi-Fi connection. 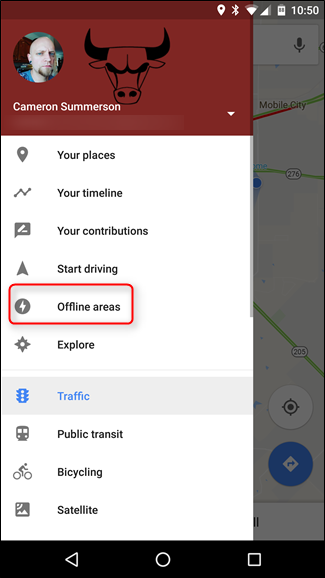 If you’re using Google Maps for daily navigation or trip planning, you’re sucking down a lot of data. 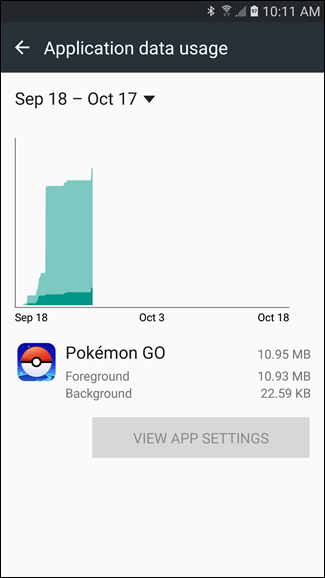 Rather than use the live updating version, you can pre-cache your route (and save a ton of mobile data usage in the process). 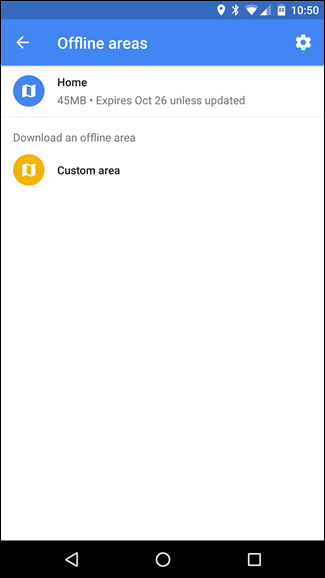 Next time you’re planning on doing some heavy Maps use, open up Maps when you’re on Wi-Fi, open the menu, and select “Offline areas.” From there, you can either tap “Home” to download maps near your house, or tap “Custom Area” to download maps for any other areas you’re going to be travelling to soon. Many streaming service apps are adding offline modes—modes that allow users to pre-cache data while on Wi-Fi to use when on their cellular data connections. Rdio, Rhapsody, Slacker Radio, and Spotify all have offline modes to help users avoid hitting their data caps. There are a lot of other areas you can cache data, too. Always be thinking about how you can offload your data usage to Wi-Fi before you’re out and about. For example, we know this is so 2003, but there’s something to be said for downloading your music, podcasts, ebooks and other media to your device from the comfort of your home (and Wi-Fi connection). In addition, don’t use task killers. At this point you shouldn’t be using a task killer in the first place, but if you are, stop now. Not only are they of dubious usefulness (and we strongly recommend against using them), but most task killers will also dump the cache files of applications they are busily killing off—which means when you go to use the app again you’ll need to download the data all over. You can apply a few of our suggestions or all of them depending on your needs and how much you need to curtail your data usage—either way, with a little careful management it’s possible to go from skirting your data-cap every month to saving money by switching to a smaller plan with very little effort.